The end of the month view is distinctly orange, although Autumn is dragging its heels this year, which suits me fine. Trees and shrubs are slow to turn, and we still have quite a lot of green left amongst the tawny. The wildlife pond was netted last week and if I say that fast, it sounds fine... in reality, it was NOT fine. 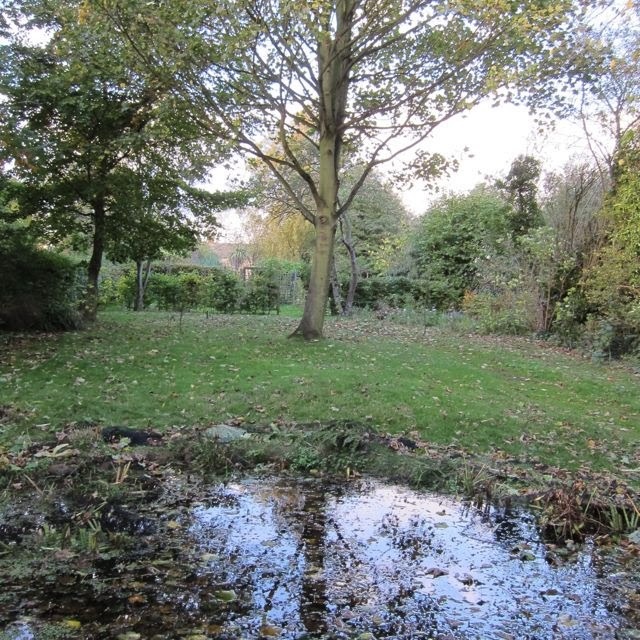 Firstly, all vegetation around the pond has to be cut down, then all vegetation IN the pond. Then all naughty leaves which have fallen in before netting have to be fished out. The pond net is huge and needs to be unrolled every year, and extended so that it covers the pond correctly. Think Christmas lights. On a mammoth scale. There is mega untaffling needed. The veg plot is having a well-earned rest and is just quietly gestating some baby leeks. We have picked our last courgettes, sweetcorn and tomatoes, dug our last potatoes and picked our last beans. The raspberry canes are all pruned and staked against the storms of winter and, oh, how smug that makes me feel ! Those winds may blow, but my boys will stand firm against the blast ! There is still some colour and form in the sub-tropical garden, Lobelia Cardinalis is still bravely flowering, and there are pink seed pods of Ricinus (perfect if you feel like finishing someone off ?? Verbena Bonariensis, Coleus and Cosmos are still hanging on in there. 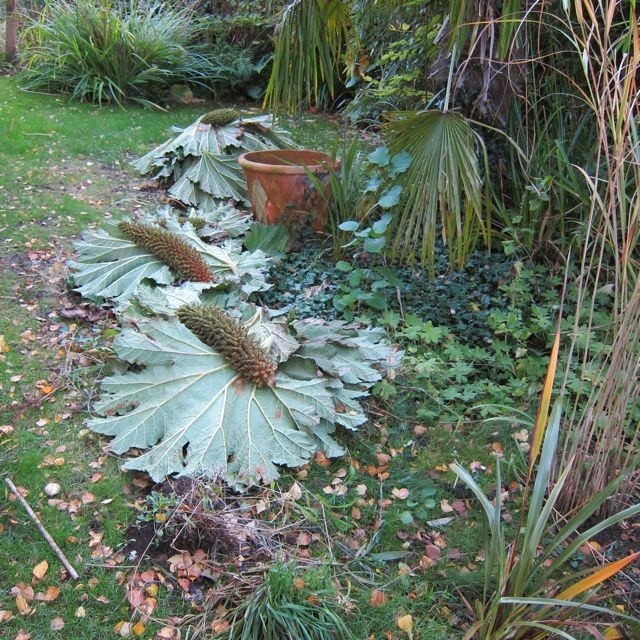 'The Exotic Gardener ' (aka my partner) has been preparing the garden for cold weather by cutting down the Gunnera leaves and using them to cover the crown, as well as taking tender things inside. 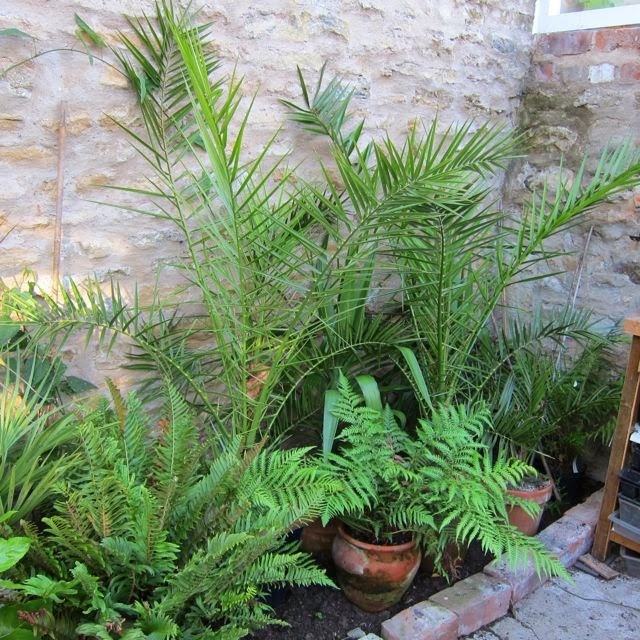 The tree ferns are next for the chop, then the trunk will be protected in a jacket, with hay in the crown and a jaunty weatherproof cap on top. The Bus shelter garden is being stripped to its bare bones, and it really is a good opportunity to assess the quality of the skeleton. 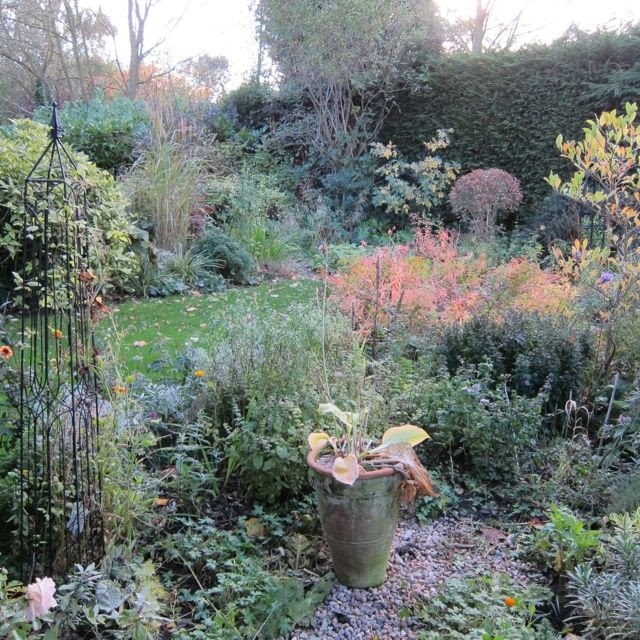 There is not much colour from blooms now, but I am reasonably pleased by the palette of foliage. I have also recently planted lots of plants that I have divided - hostas, hemerocallis, Miscanthus and Gardener's Gaiters. I am hoping that these beds really fill out next season. I suppose this little area, with Cassandra and her cellulite, remains virtually the same throughout the year, and it is an area which needs little attention- quite a relief sometimes. Everything is settling down to sleep in the ponds as the water temperature drops. Two weeks ago I was fishing leaves out, and caught at least one baby newt in every netful. I tried to do the same yesterday and didn't see one. Perhaps they have moved down to the deeper water. 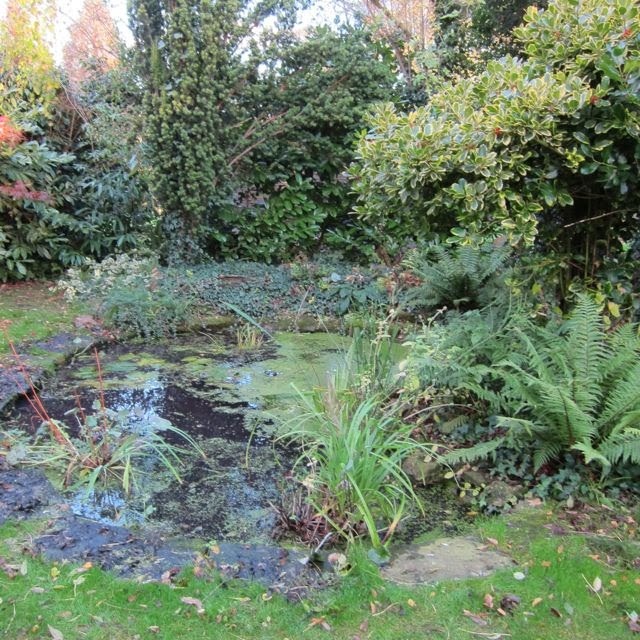 This is a view looking down to the Top pond, and the colour comes from a Cotinus Coggygria and an Acer Palmatum. Foreground colour comes from dahlias and cosmos. Euphorbia provides the splash of colour here. 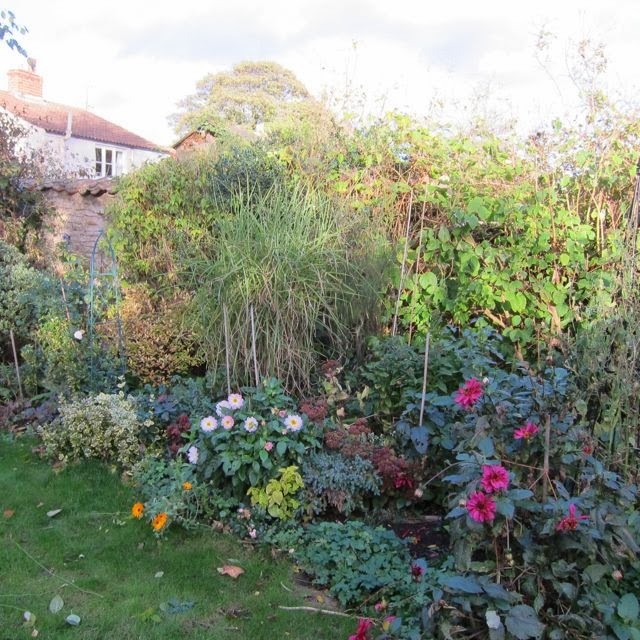 I have been working hard on the garden over the last few weeks, moving and dividing and replanting, as well as planting lots of bulbs. 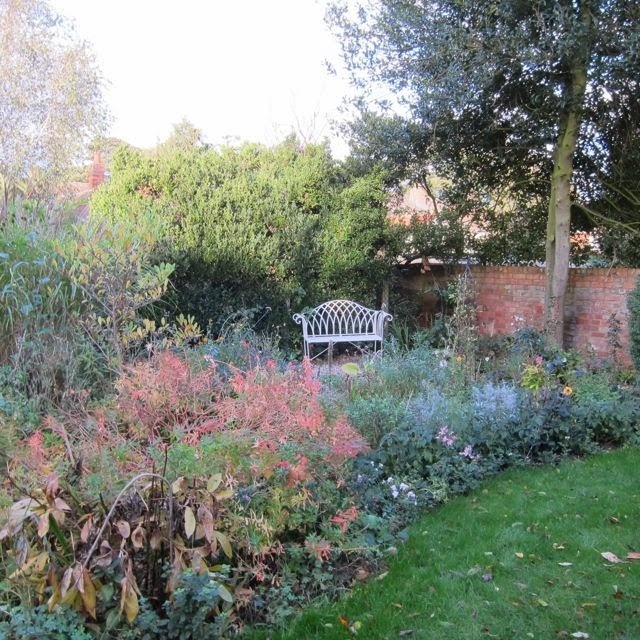 I have found my blog photos invaluable, in helping to plan where new plants should be sited, as they provide a record of the beds through the season. The edging is the Charles De Mills hedge, at the end of its first season, underplanted with the bedding rose 'Garden Party'. What a difference a few rays of sunshine make at this time of year! I have been wrecking these borders too by moving and dividing stuff, so there are lots of holes I'm afraid. This time of year does bring a few unsung heroes to the fore, however, such as the little run of geraniums which is usually overshadowing by its more spectacular neighbours. 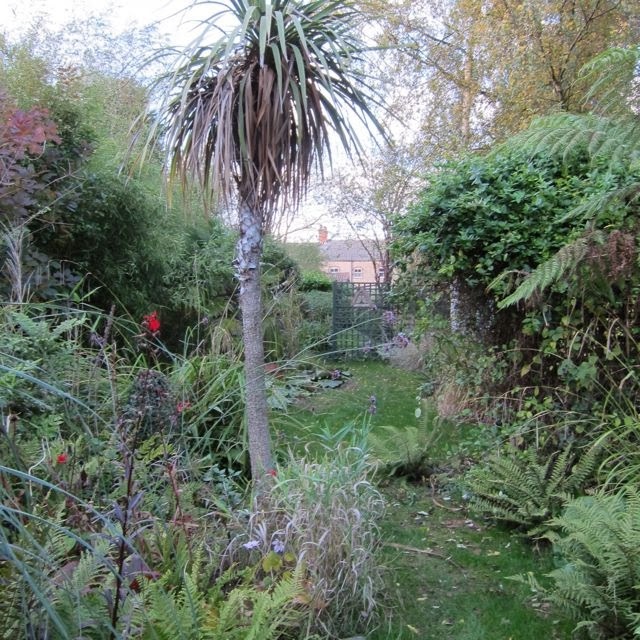 Ah, my best little bit of the whole garden! Good old dahlias, still churning out big, beautiful flowers. The tender plants are gradually being moved inside the greenhouse, and it is the first year we have been able to do this. Hopefully, this will make it easier to overwinter even our most tender ones. 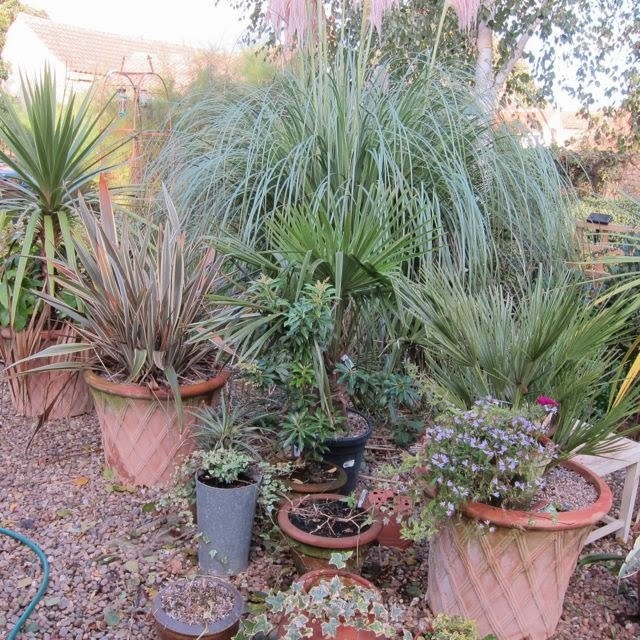 Most of the bedding has given up due to exhaustion rather than cold, but we have been planting pots up with permanent plants over the last two years, so the loss of the bedding is not so noticeable. 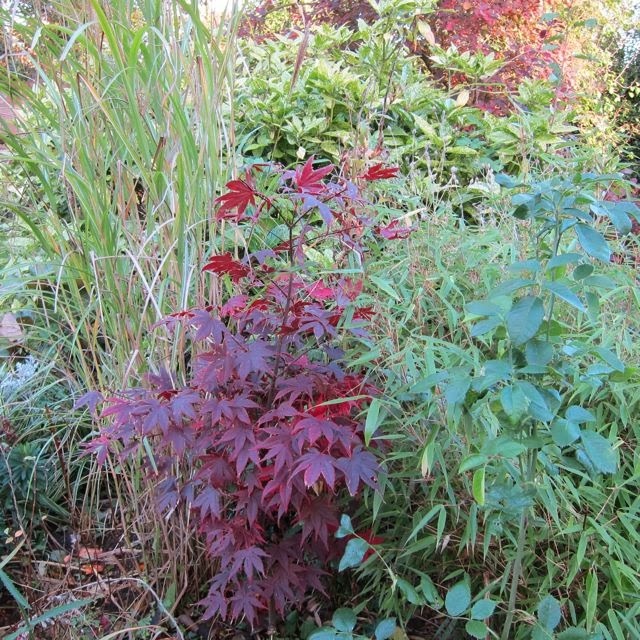 A young Acer Palmatum does not disappoint, set amongst bamboo and Miscanthus. 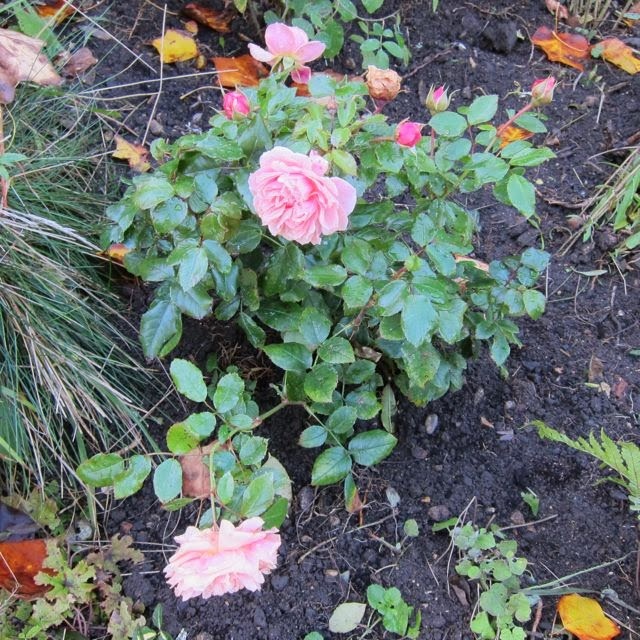 And my brand new rose 'Joi de Vivre' seems to be settling in nicely, and what pleasure those flowers are giving, this late in the season. 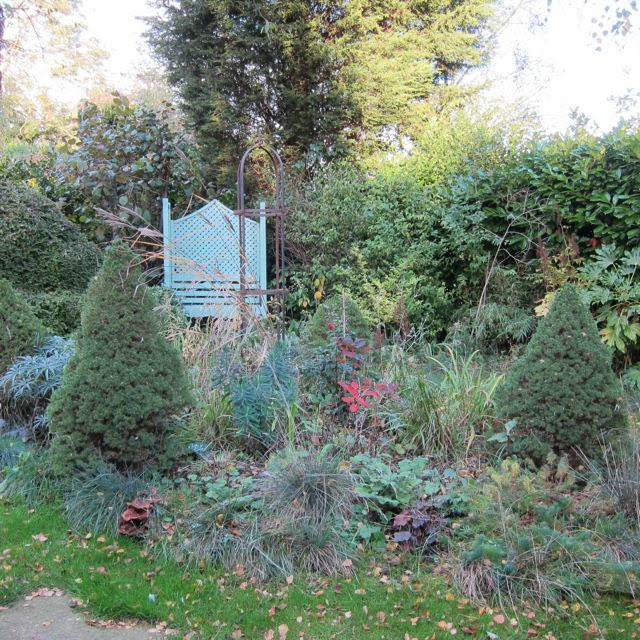 To see Helen's 'End of the month view' and to be able to hop over to other blogs to see many more, please visit 'The Patient Gardener' website. 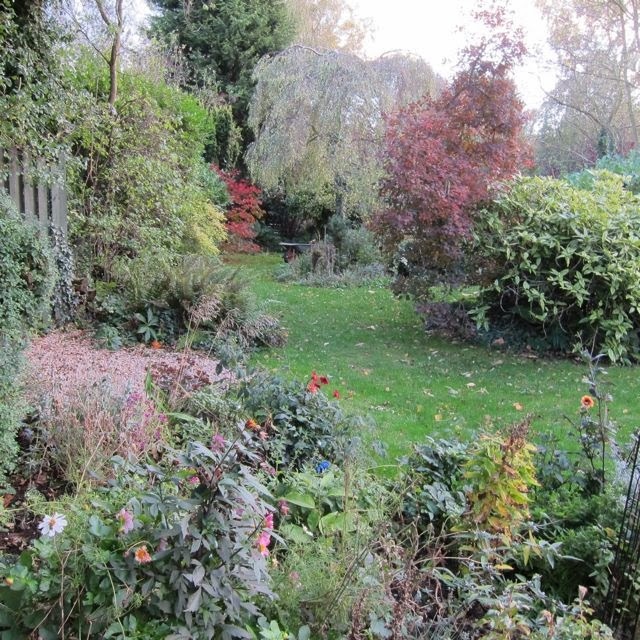 Your garden looks beautiful it its autumn colors. Pinks, reds, oranges, and everything in between. It looks fabulous. All your hard work is paying off. Beautiful! Everything is so lush. I love the greenhouse! Happy weekend, Jane! Thankyou Kukkaiselamaa, I think everything is much greener than it usually is at this time of the year, due to the very mild Autumn. Still lovely, sunny and mild today ! 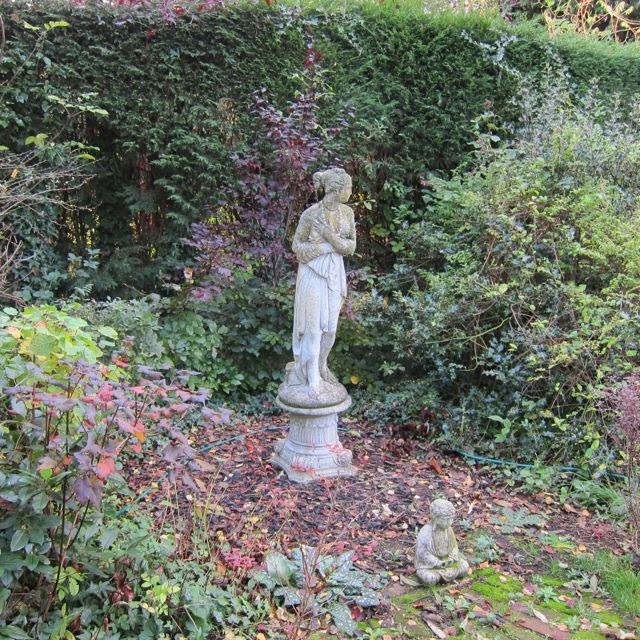 The fading beauty of your garden reminds me of Katherine Hepburn in her last few years: fragile, yet still lovely. 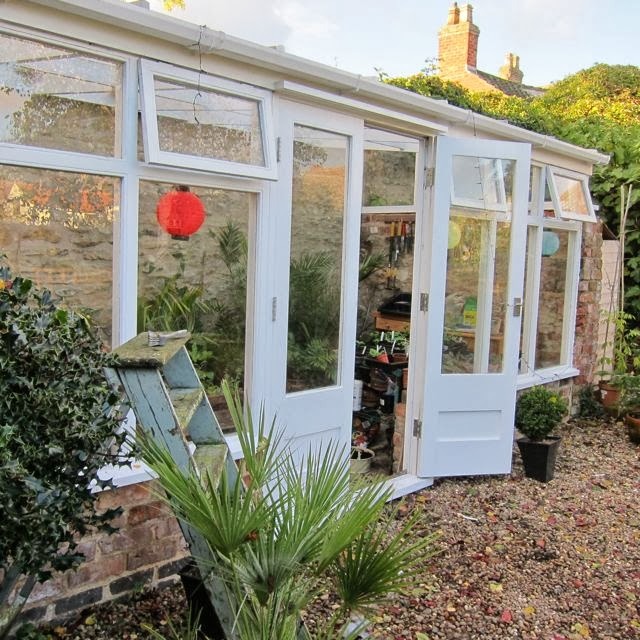 I never thought of the garden as resembling Katherine Hepburn, but I will from now on. Me ... more of a Miss Haversham I fear ! 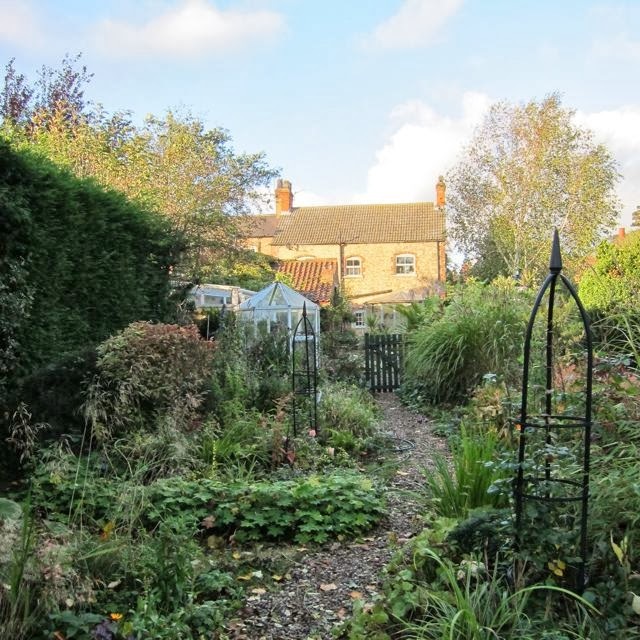 Your garden is looking great as it falls gently to sleep. Don't envy you that netting task as it my most detested job in the garden (and I don't even have a pond. Note to self: do not make more netting jobs by digging one...) I usually feel a bit bereft at this time of year. But not this one - too many wreaths to make for all my Christmas stalls! Your wreaths are fantastic ! Must make more ! Netting is the most horrible of jobs, I hate it too. This is a pretty dismal time of year despite all our reasons to be cheerful !